The second of my complementary volumes on Islam and Islamic world issues is finally up on Amazon, albeit at this point only in Kindle format. 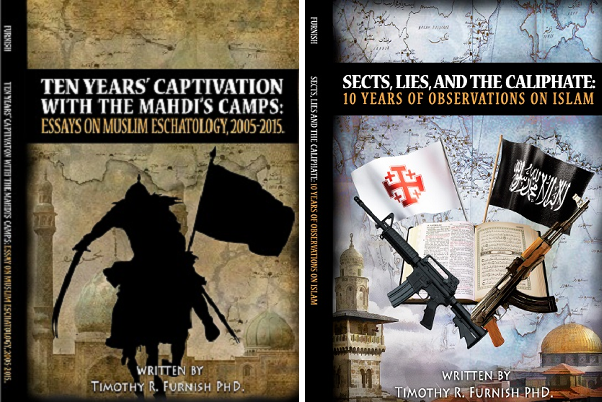 Sects, Lies, and the Caliphate: 10 Years of Observations on Islam is the follow-on to Ten Years’ Captivation with the Mahdi’s Camps, which came out in November 2015. The latter focused entirely on Islamic eschatology and apocalyptic movements (especially ISIS and Iran); the new one, on the other hand, deals with more mundane, but no less important, issues–such as the Islamic roots of ISIS and Muslim terrorism, how Christianity is indeed more peaceful and less problematic than Islam (not to mention being true), and, in the longest section (some 86 pages), on mostly failed US policies toward Islam and the Islamic world over the last decade. I shall be reviewing both books when time permits, but wanted to let you know both are now available. Tim’s previous book, Holiest Wars: Islamic Mahdis, their Jihads, and Osama bin Laden (Praeger, 2005) is more scholarly — it’s Tim’s doctoral dissertation-turned-book. These two books bring us up to date on Tim’s thinking since then.